TWICE A DAY at least I reach into a paper bag in my refrigerator and pull out an apple. It could be any color, size, or shape — I like to be surprised. I take an apple on my morning and afternoon walks, where it can be savored in its natural environment, without distraction. An apple is perfect for walking, clean and compact, fitting neatly in my pocket, giving me a sweet energy boost and fresh juice along the way. Apples work on all the senses, beautiful to behold (especially in contrast with November’s muted landscape) and lightly perfuming the air, their smooth, round or conical shape weighing comfortably in my hand. 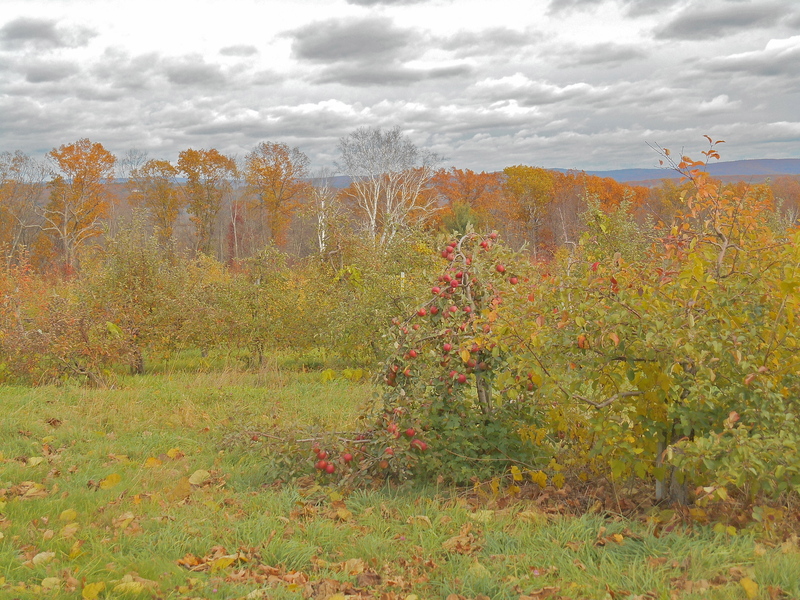 While the last New England apples have been picked, the bounty of the harvest will last until late spring, at least. During the fresh harvest I was able to amass a wide variety of my favorite apples from around New England, which will supply my walks at least through Thanksgiving. 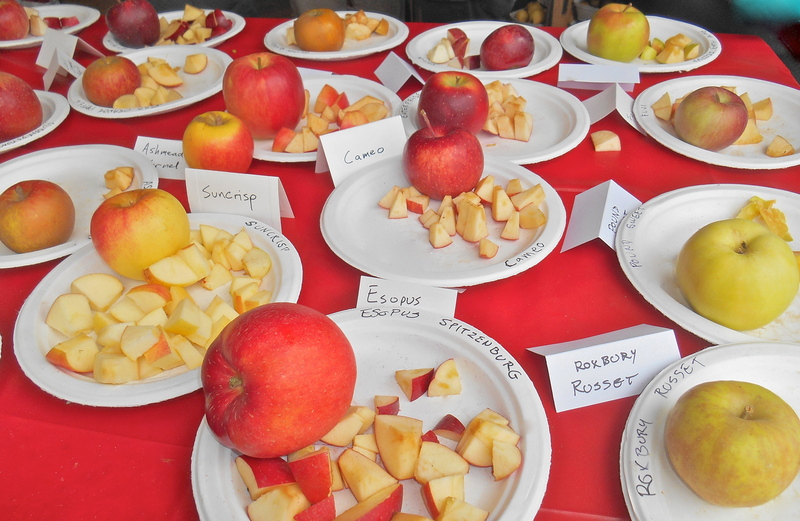 From my orchard visits in October I picked up small bags of Baldwin, Northern Spy, Rhode Island Greening, plus Honeycrisp, Jonagold, and McIntosh. I had some Gala, Empire, Macoun, and a few Silken left over from our booth at the Eastern States Exposition (“The Big E”) in September. One bag is filled with heirloom varieties like Esopus Spitzenburg, Ribston Pippin, and Roxbury Russet. 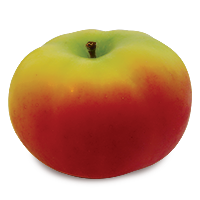 There are a few loose stragglers on the refrigerator’s shelves, a Golden Delicious one day, Suncrisp the next. I never know what I will retrieve when I reach in. Monday I ate a Jonagold in the morning, and a Macoun in the afternoon — two of my favorite fresh eating apples. 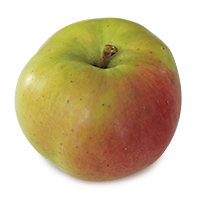 There are mixed reports about the storage qualities of Jonagold, a 1968 cross of Golden Delicious and Jonathan, but this one, purchased a month ago, held up beautifully, crisp and loaded with juice, with its characteristic flavor, sweet with a little tartness. 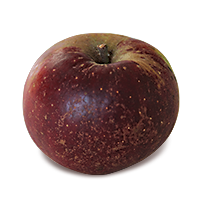 After a similar time in storage, the Macoun, the offspring of McIntosh and Jersey Black parents introduced in 1923, remained crisp, and its flavor was rich and complex, with its spicy, strawberry notes more pronounced than ever. Tuesday I ate two heirlooms, McIntosh from Canada (1801), and Northern Spy (1840 New York, from seeds from Connecticut). 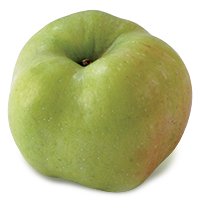 The Mac was outstanding, early in its flavor “arc” that sees the apple gradually sweeten and soften over several months. 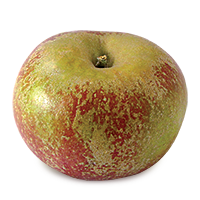 It had been two months since this McIntosh was harvested, and much of the apple’s tartness remained intact, giving it a rich flavor as beguiling as fresh-picked and spicier, more complex. 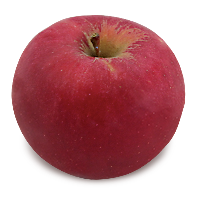 The pink Northern Spy was huge, firm, and juicy, its initial tartness gradually transforming into something broader and deeper. 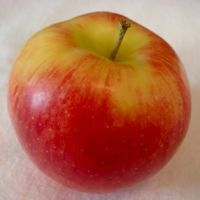 It is easy to see why this apple was a favorite for nearly a century despite being somewhat unreliable and difficult to grow, as it stores well, and is equally good for fresh eating and baking. I began Wednesday with a giant Honeycrisp that had been sitting in the crisper drawer for about two months. 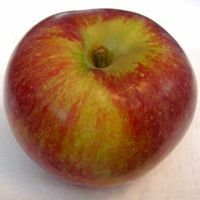 While still juicy, its flavor was unexceptional, certainly nothing like what the apple has become famous for since it hit the marketplace in 1991, from a 1961 cross of Keepsake and an unnamed seedling at the University of Minnesota. Some Honeycrisp store better than others, depending on where they were grown and when they were picked, but it is an apple that is appreciably better eaten fresh. 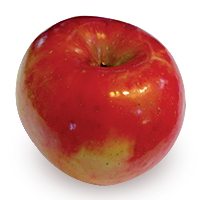 A good Honeycrisp can also be almost solid pink-red in color, much like Northern Spy. I ended the day with a Baldwin, one of New England’s oldest varieties, dating back to 1740 in Wilmington, Massachusetts. 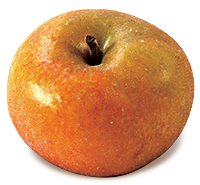 Baldwin was the region’s most popular apple for nearly a century before McIntosh’s ascendancy in the early 1900s. The Baldwin I ate was the crispest and tartest of the six apples I tasted during the three days (it may have been the last of these varieties to be picked). Beneath its round, nearly solid vermillion skin, freckled with cream-colored pores, or lenticels, the Baldwin’s crisp, juicy flesh was pleasingly tart at first but finished sweeter, ending in sublime flavors of pineapple and melon. When trying a new variety, always purchase at least four apples. Eat two of the apples a few days apart, within a week of purchase. No two apples are exactly alike. Subtle flavors like vanilla, nuts, or mango can vary in intensity from apple to apple, and sometimes can be hard to detect. 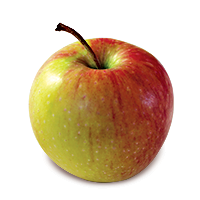 By trying two fresh apples, you are more likely to experience the variety’s full range of flavors. Place the other two apples in your refrigerator, and mark the date they were purchased or picked. Ideally, seal the apples in plastic bags and store them in your crisper drawer. As long as they are kept cold, though, most apples keep pretty well in a paper bag. Either bag helps them retain moisture, and keeps them from absorbing odors from foods around them. Wait a month before tasting the first of these stored apples. Note if there is an appreciable difference in flavor and texture, good or bad. Some apples peak in flavor around this time. Many varieties follow a similar ripening arc, albeit it at different rates, gradually losing some of their initial tartness and becoming sweeter, more complex, and juicier over time. The same variety can be appreciated in different seasons for different reasons. From a crisp, tart green apple in late September, Shamrock gets progressively spicier and juicier for about a month before it begins to break down. The flesh of the Connecticut heirloom Sheep’s Nose is dry at harvest, but becomes mellower and juicier after a month or more in storage. 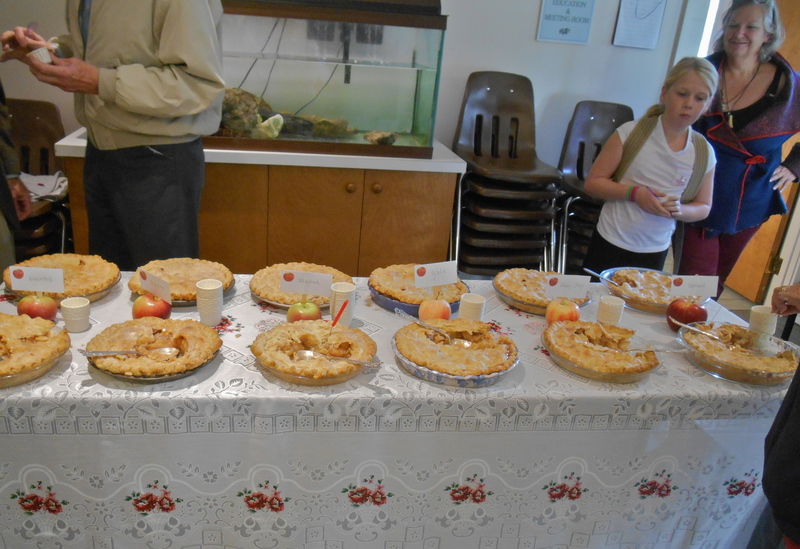 Idared’s best flavor will not emerge until the new year, when it excels in pies and in cider. The flavor of Suncrisp is said to improve in storage, but I wouldn’t know — I enjoy their sweet-tart, citrusy taste so much eaten fresh that I cannot seem to make one last long enough to find out. I have one left in my refrigerator this year, and I am determined to make it last to December, at least. 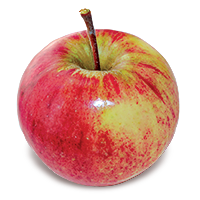 If your apple has held up well for 30 days, leave the remaining one in the refrigerator for another month (or more) before tasting it. Fuji is famous for its storage qualities. Russeted-covered apples like Ashmead’s Kernel and Roxbury Russet are well known for developing richer, more complex flavors in storage, sometimes months after they have been harvested. 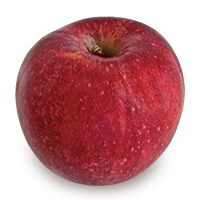 Obviously, the apples available now in grocery stores, farmers markets, orchards, and farm stands, were picked weeks ago. But they have been maintained in either regular, or controlled atmosphere (CA) storage, retarding their ripening process. 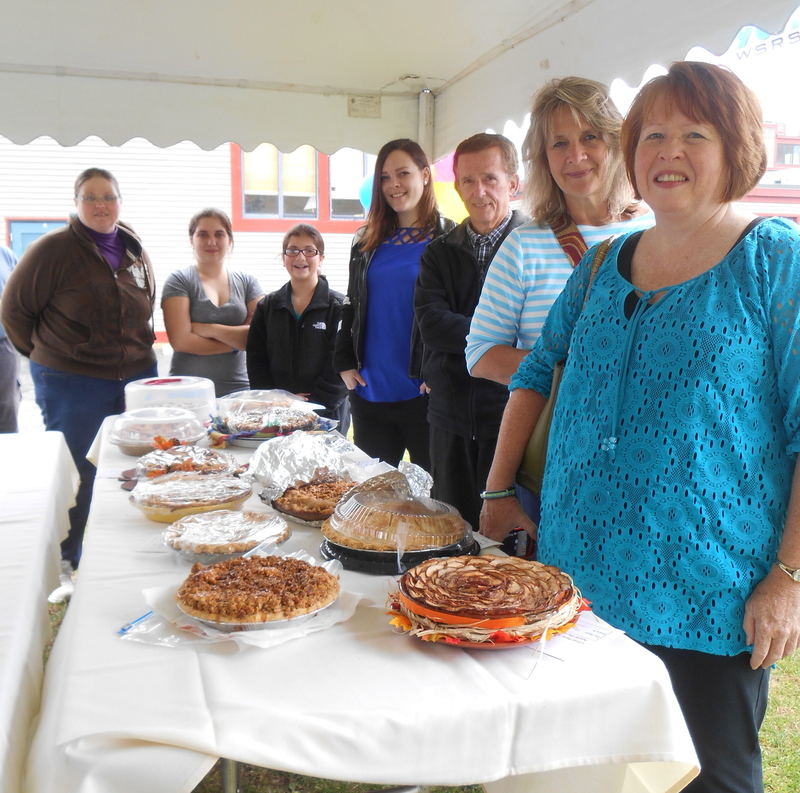 Stored properly — meaning kept cold — the apples may be slightly less crisp than the day they were picked, but not much. 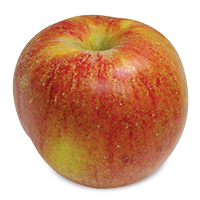 You can test an apple’s ripening qualities any time you make your purchase. Don’t reject perfectly good fruit. You can’t always judge an apple by its skin. 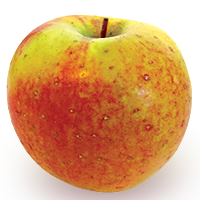 Most surface blemishes on an apple are harmless and easily removed, such as a patch of apple scab, a dent from hail, or spot russeting. An otherwise fine apple can be misshapen because it rested on a branch as it grew. The apple’s flavor is in no way impaired. 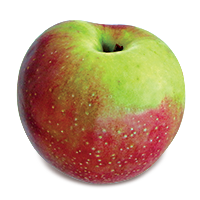 All apples bruise if treated roughly, and some varieties are more susceptible than others. A thin-skinned apple like Silken or a tender-fleshed one like McIntosh require special care in handling. But a bruise here and there on an apple’s surface can easily be ignored, avoided, or removed. A perfectly good apple often awaits beneath that less-than-perfect exterior. The Galas from The Big E are looking a little wrinkly on the outside, but their flesh remains firm and their flavor is as good as ever. The color of Galas changes in storage, too. It typically has patches of yellow at harvest, and gradually deepens to a rich red-orange. Rub the apple, eat the skin. While apples leave the orchard and packinghouse clean, like all produce it is best to wash them off before eating, mostly because of the possibility of contamination by human handlers. You never know who may have previously picked up that apple in the bin. 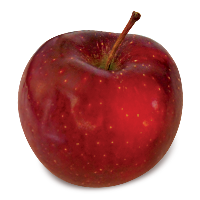 The natural film or “bloom” on an apple, sometimes mistaken for pesticide residue, helps the apple retain moisture. Some of the bloom gets washed off in the packinghouse, and in some cases a drop of wax is applied to replenish it and give the apples a shine. Both the natural bloom and the cosmetic wax are harmless. The majority of the chemicals used to treat apple pests and disease are applied in the spring and early summer, some before the fruit is even formed. Most residual traces of chemicals are washed off by rain over the summer, and apples entering the packinghouse are first dunked in a tank of water where they float for ten feet or more before entering the packing line, where they will be further buffed and brushed along the way. But it’s always a good idea to clean your fruit before you eat it. The beauty of the apple is that you don’t need water to wash it— just rub it on your shirt, especially convenient when outdoors. 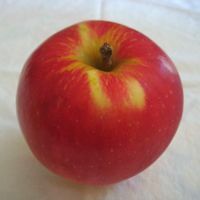 The peel and the flesh just beneath it contain much of the apple’s nutrients, so there are compelling reasons to eat it. That’s automatic for most people eating a fresh apple, but requires some rethinking on the part of many bakers and cooks. 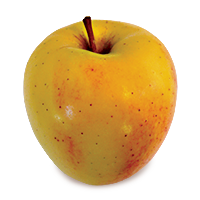 Prepared properly, though, apple skins can add color as well as nutrients to any dish. Make sure your apples are ripe. It’s good to know what you are getting. The best way to tell if an apple is ripe is by examining its seeds. The apple should not be picked until the seeds are dark brown, almost black, in color. 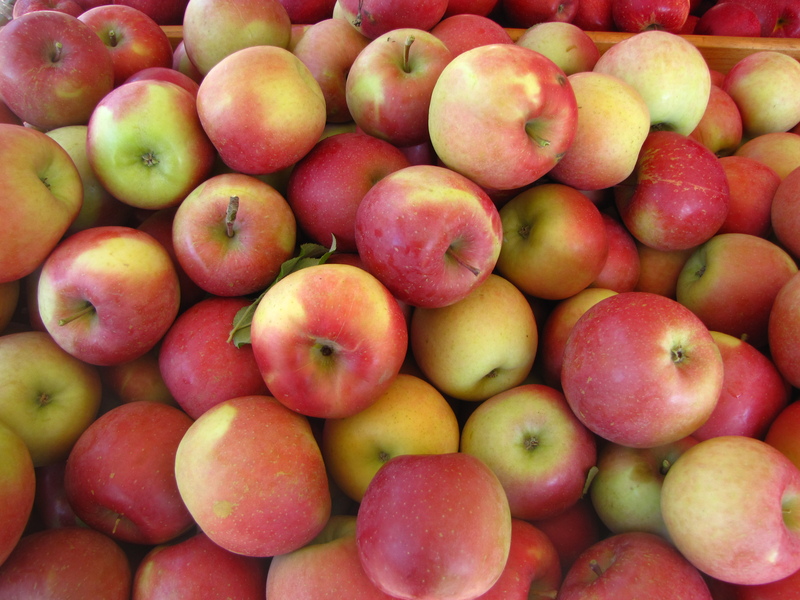 If you find that some of your apples were not fully ripe when picked, you can eat them without harm. They are likely to be more tart than usual, though, may not store as well, and may have inferior flavor. I purchased some Ginger Golds in August, and when I cut several of them open, their seeds were white, not brown. The apples tasted alright, but nowhere near as good as Ginger Golds I have had in the past. Today, two-and-a-half months later, the apples have slowly ripened in my refrigerator, and the seeds are now medium brown. But the ripening has been uneven; the flavor is not much improved, the flesh is beginning to go soft, and they are not very juicy. Reluctantly, I’ll have to throw them out. 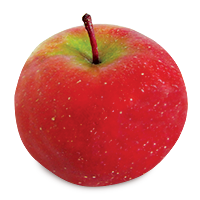 For more information about New England apples, including where to find them, visit New England Apples. 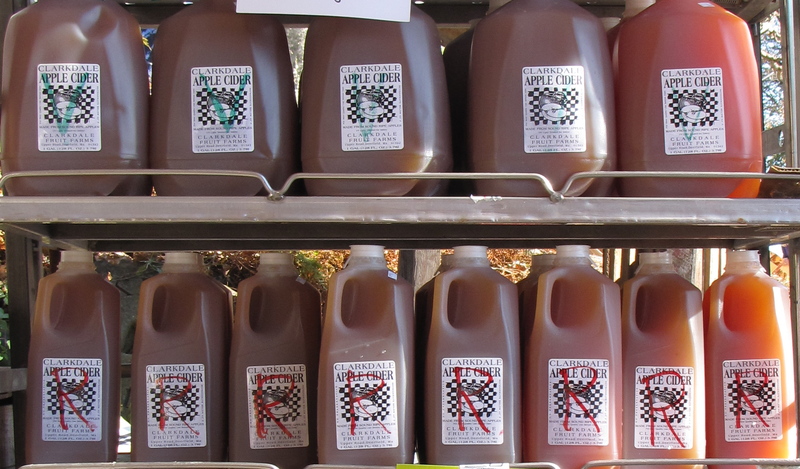 A RENEWED INTEREST IN APPLE CIDER, fresh and hard, is evident wherever it is sold. 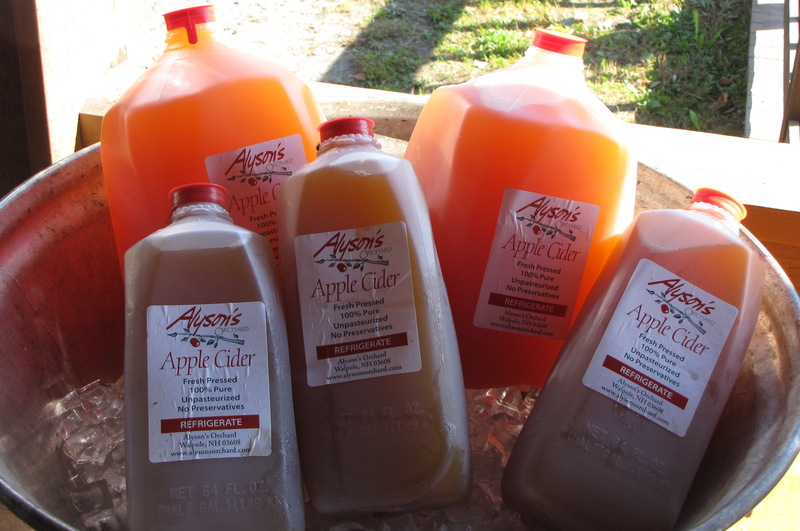 Visitors to the New England Apples booth in the Massachusetts Building at the Eastern States Exposition (“The Big E”) bought more than 300 gallons of Carlson Orchards fresh cider in seven-ounce cups over 17 days in September — and fresh cider was sold at a dozen other places at the fair. 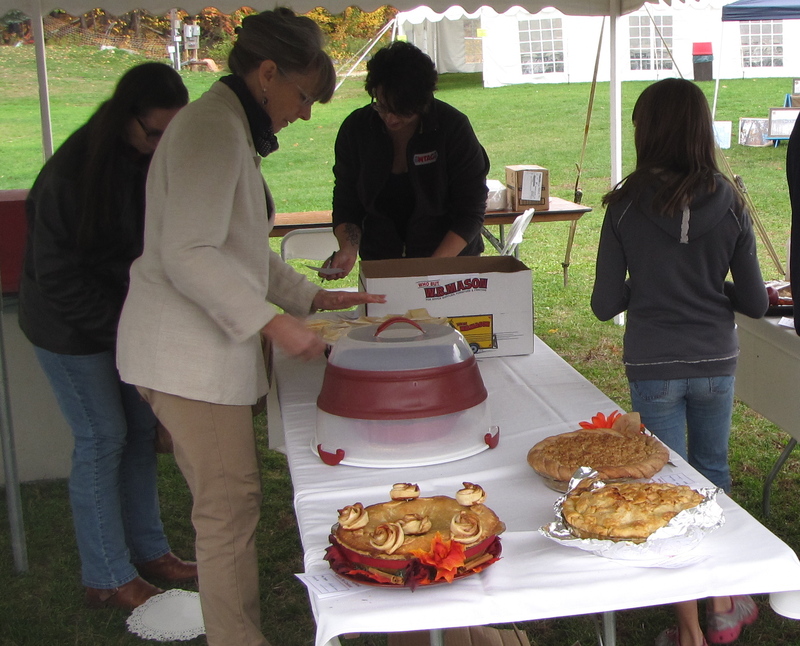 Beginning this Friday, October 31, cider aficionados from not just New England, but across the country and around the globe, will gather in western Massachusetts, to celebrate the 20th Annual Franklin County CiderDays. The event continues through Sunday, November 2, with a wide range of tastings, panels, orchard tours, and more at orchards across the county (click on the link above for a full schedule of events). Next month comes Vermont Cider Week, actually a 10-day affair beginning Friday, November 14, through Sunday, November 23, with tastings at a number of venues. Why this renewed interest in what was once America’s favorite drink? IT STARTS with the incomparable flavors produced by squeezing the juice out of apples. Even the most sour or bitter apple is transformed into something special when pressed into juice, and the blends made by expert cider makers add richness and body to the experience. Slightly fizzy, lightly alcoholic hard cider, once consumed year-round by young and old alike, expands the range of flavors even further, from sweet to dry. 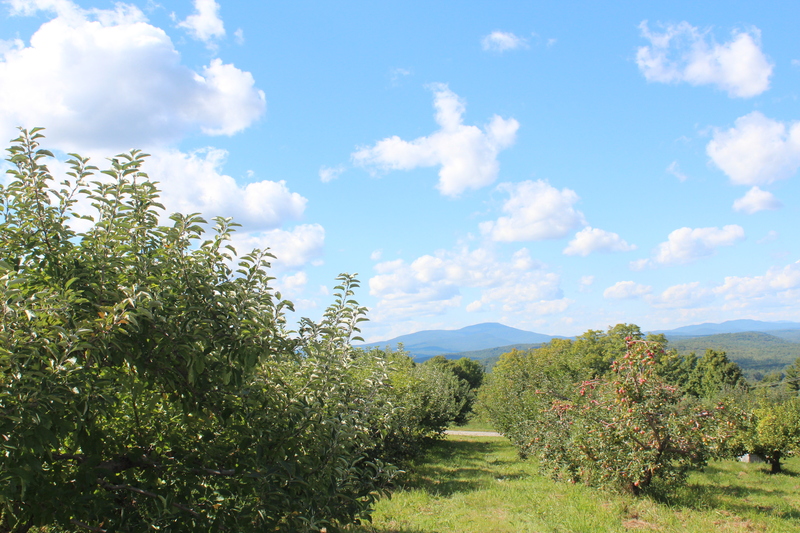 New England cider typically is made from locally grown fruit. Drinking it connects us to the land, and to our past. To press, ferment, and drink cider is to partake in a tradition that dates back to the 1620s, less than a decade after the Mayflower landed at Plymouth Rock. Cider’s dominance ended in the mid-1800s, squeezed by temperance movements that targeted hard cider at the beginning and end of the 19th century. Rural New Englanders flocked to its cities during the Industrial Revolution, where immigrant populations, especially from Germany, demonstrated a talent for brewing beer, an inexpensive alternative to hard cider. Passage of the Volstead Act in 1919 led to Prohibition, further reducing demand for hard cider, and the market never recovered even after Prohibition was lifted in 1933. People still thirsted for fresh cider, though, and almost every orchard, large or small, pressed its own until 1996, when an isolated tragedy in the Pacific Northwest permanently changed the landscape for producers. The incident involved Escherichia coli (E. coli) contamination traced to a single source, the Odwalla Juice Company in Washington state. One child died and more than 60 people became ill after drinking Odwalla fresh apple juice. Odwalla immediately recalled all its products containing apple or carrot juice, and in 1998 pleaded guilty to 16 misdemeanor charges of selling adulterated food products, paying a $1.5 million fine. Odwalla made improvements to its production line in an effort to avoid future outbreaks, and began to flash pasteurize its juices. AS ITS LONG AND ILLUSTRIOUS history suggests, New England cider has always been safe to drink. In all of my research for Apples of New England, I did not encounter a single report of illness traced to New England cider, and I am not aware of any in my lifetime — including nearly 20 years working with the New England apple industry. Yet the Odwalla incident resulted in new regulations for how apples and other crops are harvested and processed. The federal Food and Drug Administration (FDA) eventually required that all fresh cider be pasteurized, with the exception of small producers who sell at their orchard or farm stand (they must attach a warning label). Many small orchards chose not to invest in the expensive equipment needed to pasteurize and simply stopped pressing cider. Common sense, tradition, and its irresistible flavor appear to be overcoming this latest taint on cider, judging by the demand for fresh ciders like Carlson’s, the popularity of festivals like CiderDays, and the proliferation of artisanal hard ciders and commercial brands like Angry Orchard, Harpoon, and Woodchuck. 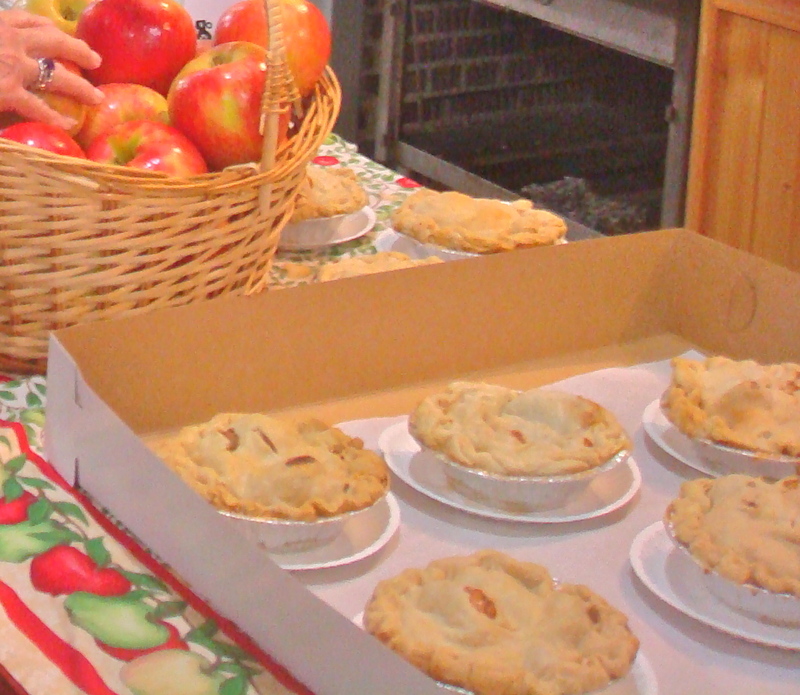 It is not just fresh and hard cider, either, that appeals to the apple-loving palate. A new generation of vintners is coming up with distinctive dry and semi-dry apple wines in addition to the traditional sweet dessert ones, and niche products like ice cider are capturing the apple’s essence and showing its remarkable versatility in new and exciting ways. The term “apple juice” applies to the clear, amber liquid sold in bottles in grocery stores. “Fresh cider” is the name for the brown, unfiltered apple drink sold at farm stands, farmers’ markets, and orchards, and in the refrigerated sections of grocery stores, usually in the produce aisles. “Hard cider” is the alcoholic drink fermented from fresh cider, roughly as strong as beer. Bottled apple juice is fresh cider that has been heated above 175°F for 15 minutes to 30 minutes, then filtered to a clear liquid. Commercial apple juice is also made from concentrate and water. With the help of stabilizers and preservatives, bottled apple juice stores indefinitely. 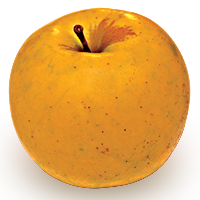 Fresh cider, the sweet, thick drink found at most orchards, contains nothing but apples. If sugar or any other ingredients have been added, it is not the same drink. Unpasteurized fresh cider will keep approximately 10 days to two weeks, several weeks if pasteurized, and up to several months with preservatives like potassium sorbate, added by some of the largest producers and grocery stores. Fresh cider may be frozen for up to six months. 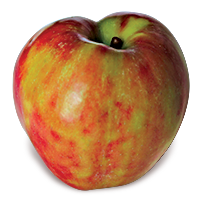 Any apple can be used in fresh or hard cider, even an unnamed chance seedling, and each variety contributes distinct sweet, acid, or astringent properties. 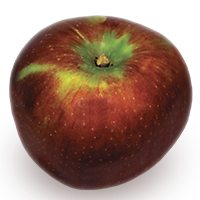 All-purpose heirlooms like Ashmead’s Kernel, Golden Russet, and Roxbury Russet are particularly prized for cider, while varieties like Dabinett, Harry Masters Jersey, Tremlett’s Bitter, and Yarlington Mill are cultivated exclusively for fresh and hard cider. Large-scale makers of fresh cider necessarily rely on varieties planted in sufficient quantities to meet their high demand, which rules out most heirlooms. Varieties like Cortland, Gala, McIntosh, Idared, PaulaRed, and other New England staples are used according to season. An early season batch may differ slightly in taste from one made later in the year. 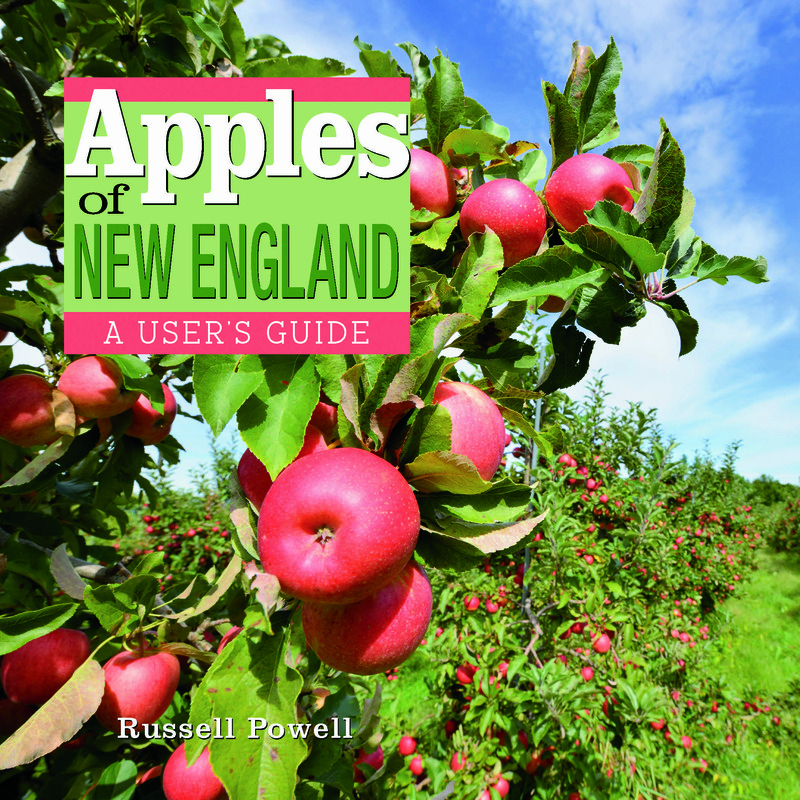 AUTHOR RUSSELL STEVEN POWELL, senior writer for the New England Apple Association, and Executive Director Bar Lois Weeks will discuss apples, answer questions, and sign their new book, Apples of New England, at at three western Massachusetts orchards during CiderDays weekend. 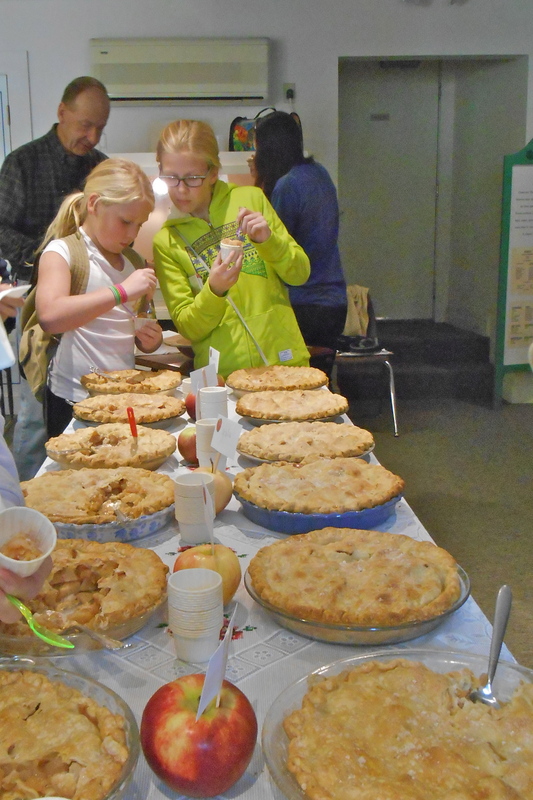 As part of CiderDays, Powell and Weeks will appear at Pine Hill Orchards, 248 Greenfield Rd., Colrain, Saturday, November 1, from 10 a.m. to 12 noon, and at Clarkdale Fruit Farms, 303 Upper Rd., Deerfield, Sunday, November 2, also from 10 a.m. to noon. 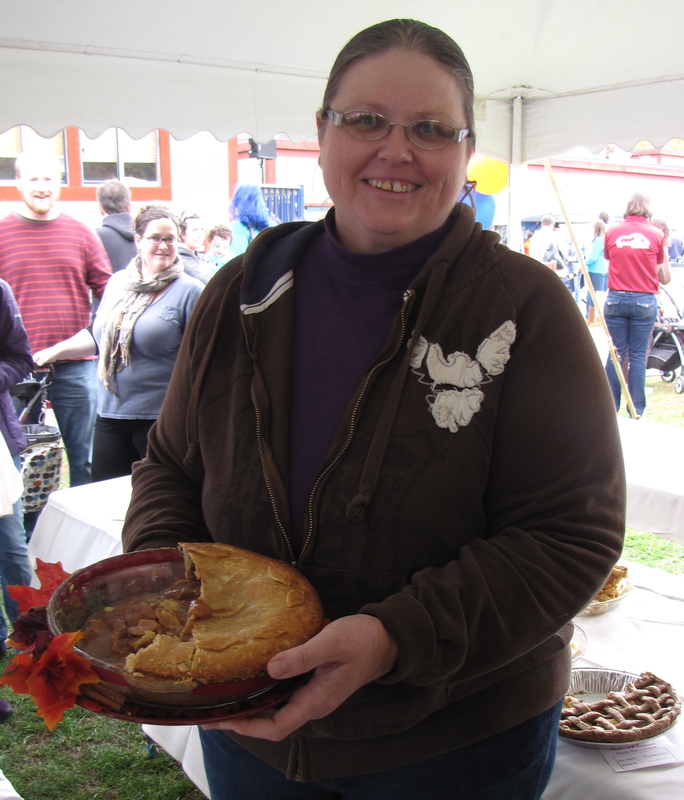 Powell and Weeks will also appear at Atkins Farm, 1150 West St., Amherst, Saturday from 2 p.m. to 4 p.m. 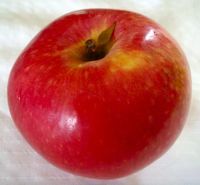 THE LIST of apples developed in Japan that have thrived in New England is short and sweet yet spans the growing season. The five apples profiled here are relatively new, none older than 1930. 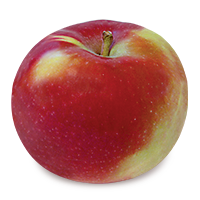 Fuji has become one of the best-known apples in the world since its commercial release a half-century ago. 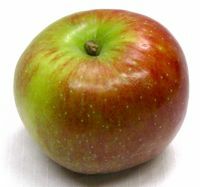 It is a medium to large, yellow-green apple covered with a heavy pink blush. 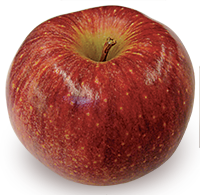 A late-season apple with dense, juicy white flesh, its sweet flavor owes primarily to its Red Delicious parent. 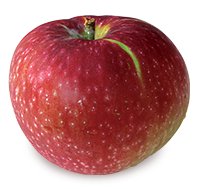 Fuji’s other parent, the Virginia heirloom Ralls Janet, is a good eating apple known for its late bloom, making Fuji less susceptible to frost damage than many varieties. Fuji stores exceptionally well, maintaining its quality for several weeks left in a fruit bowl or for up to one year refrigerated. 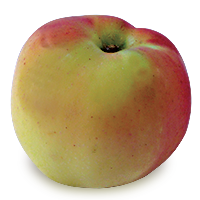 Mutsu, or Crispin, is a large, slightly conical apple ranging in color from green to yellow, often with an orange blush. 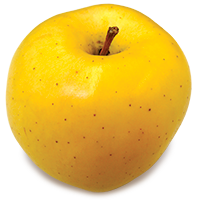 Its crisp, pale yellow flesh is aromatic, sweeter than tart, and juicy. It is more tart than either its Golden Delicious or Indo parents. 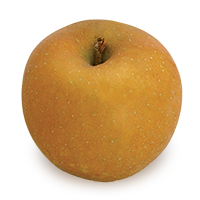 Mutsu is an all-purpose apple, especially good in salads as its flesh browns slowly. 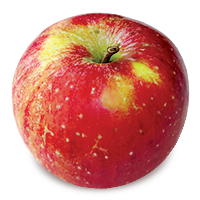 It is a good pie apple due to its flavor and size, and because it holds it shape when cooked. It stores extremely well. Originally named for a province in Japan, Mutsu was discovered in 1930 and released in 1948. It was renamed Crispin in England in 1968, but more often is sold as Mutsu in New England. 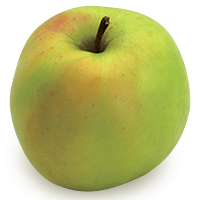 Shizuka is a large, round or conical, green-yellow apple with a red-orange blush. 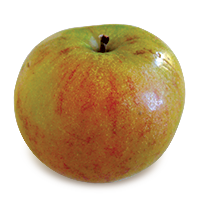 A late-season apple, Shizuka has the same parentage as Mutsu: Golden Delicious crossed with Indo, a sweet Japanese apple from the 1930s. But Shizuka’s flavor and texture are very different. 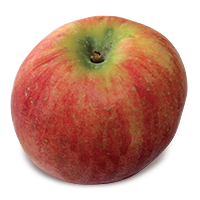 Shizuka has distinctive light crisp flesh similar to Honeycrisp and Jonagold, and it is sweeter than Mutsu. It is excellent eaten fresh or in a salad, as it is slow to brown when cut. It stores well. Shizuka was developed by Tsuneo Murakami in Aomori prefecture in 1969, and released commercially in 1986. Like Jonagold and Karmijn de Sonnaville, Shizuka’s popularity has lagged behind its virtues in the United States, in part, perhaps, as a result of its unremarkable name. In contrast to these late-season apples are two early season varieties, Akane and Sansa. Akane (ah ‘kah neh) is known as Tokyo Rose and Prime Red in its native Japan, and Primrouge in France for its striking red color. It has sweet-tart flavor with hints of strawberry, crisp white flesh, and lots of juice. 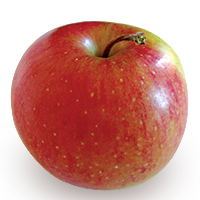 One of the best early season apples, it is good for baking as well as for fresh eating, as it holds its shape well. 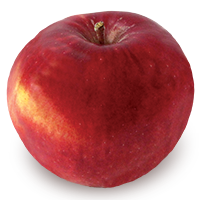 Akane is the result of a cross between the English heirloom Worcester Pearmain, known for its strawberry flavor, and Jonathan, an American heirloom with outstanding flavor and distinctive red color. Akane was discovered in 1937 and released in 1970. Sansa is medium sized, round, and typically red in color (it can also appear with a deep pink blush on a yellow skin). It is sweet and juicy, with crisp, light-green flesh. 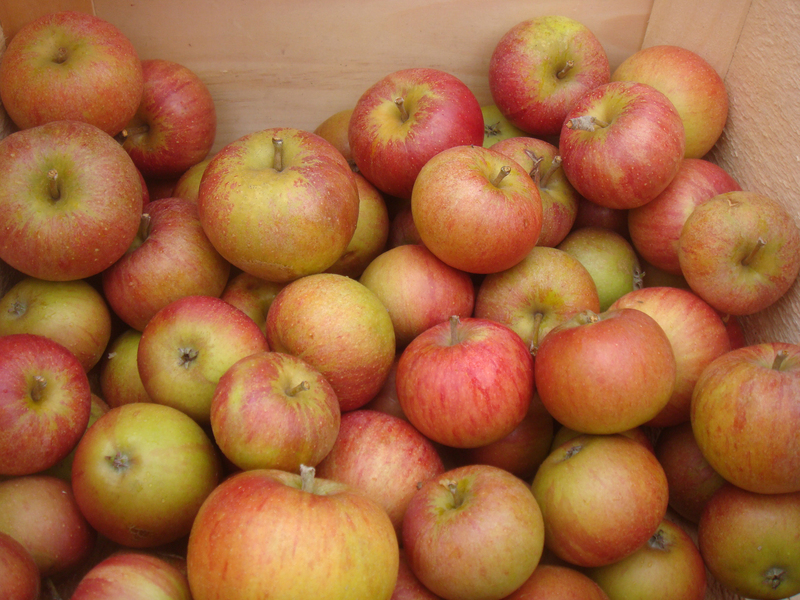 Considered best for fresh eating, it is one of the better early season apples. Sansa is the result of a collaboration between researchers in Japan and New Zealand. 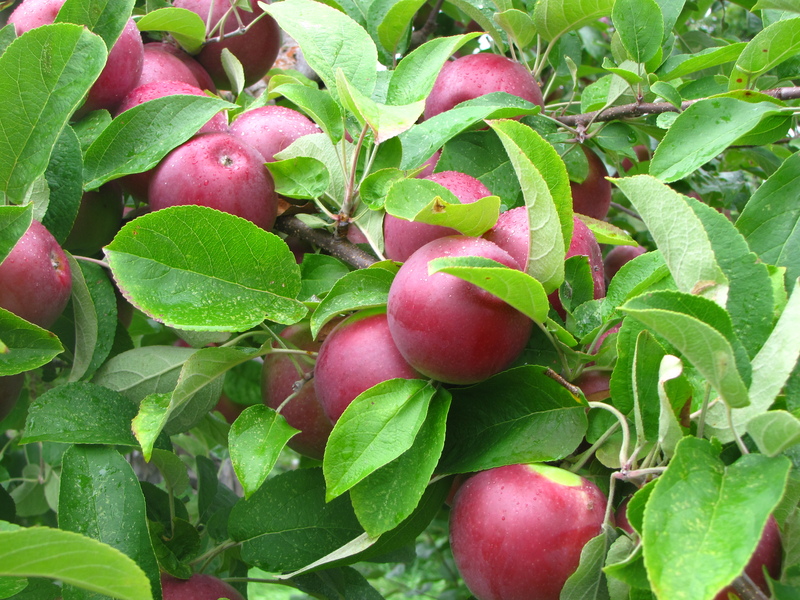 The apple’s parents are Japan’s Akane and New Zealand’s Gala, which gives Sansa its characteristic sweetness. In 1969, Japanese apple breeder Dr. Yoshio Yoshida sent pollen harvested from Akane blossoms to Dr. Donald McKenzie in New Zealand, to cross-pollinate with Gala. Gala was not grown in Japan at the time, and Akane was not available in New Zealand. McKenzie returned seeds from this cross to Yoshida, and the resulting trees were evaluated for nearly 20 years before the variety’s 1988 release. McKenzie did not live to see the result of their joint effort, though, as he was killed in a car accident that same year. RUSSELL STEVEN POWELL will discuss apples and read from his new book, Apples of New England (Countryman Press), at several sites during and after the Columbus Day Weekend. EUROPEAN COUNTRIES have produced only a few new apples in recent years. But several venerable heirlooms still grown in New England originated in France, Germany, and The Netherlands. 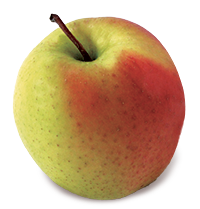 Many of the apples are so old and the records so incomplete that their country of origin cannot be completely certain. 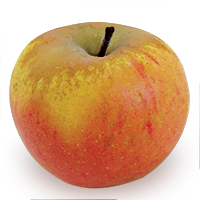 AMONG THE BEST New England apples generally credited to France are three of the oldest named varieties: Ananas Reinette, Calville Blanc d’Hiver, and Lady. 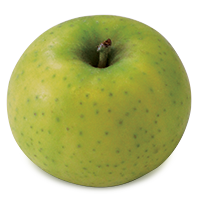 Ananas Reinette (ô-nô-ńas rĭ-ńĕt) is a small, late-season apple, round or slightly oblate, with rich yellow color over green skin, and prominent green or brown lenticels (the dots on an apple’s skin through which it “breathes”). Ananas Reinette has crisp, juicy, white flesh, and a balanced, sweet-tart flavor with hints of pineapple (“ananas” is French for pineapple). Its distinctive flavor intensifies in storage. Although it was first cited in 1821 in Germany, it may have originated in The Netherlands or France in the 1500s. It received scant mention in American reference works before 1950. 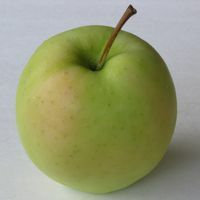 Calville Blanc d’Hiver (kal-vəl bläŋk dē-ver), or simply White Calville, is another late-season apple with yellow-green skin. It is medium to large, with a distinctive ribbed shape and an occasional pink blush. 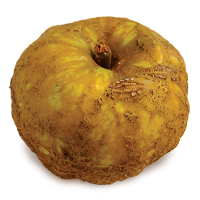 Its aromatic, cream-colored flesh is spicy, more tart than sweet, and its flavor intensifies in storage. 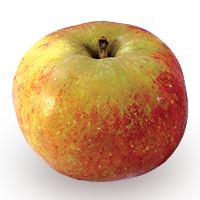 It is high in Vitamin C. One of Thomas Jefferson’s favorite apples, it is mostly used in cooking and in cider, and it stores well. Its age and origin are unknown, but it was first recorded in 1598 France (some accounts attribute it to Germany). 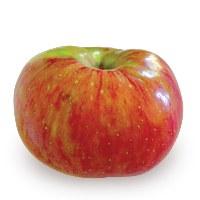 Another late season apple, Lady, also known as Api or Christmas Apple, is small in size but intense in flavor. Its red-and-green color varies according to the amount of sunlight it gets; the green areas can lighten to yellow. Its bright white flesh is crisp, juicy, and tart, with hints of citrus. Lady is best in salads, eaten fresh, and pickled, sweet or sour, and sometimes served with a hot sauce. Due to its small size, festive coloring, and ability to withstand a freeze, Lady is often featured in Christmas wreaths. Lady has been cultivated in France at least since the reign of Louis XIII in the 1600s. But it may be even older, dating back to ancient Rome. It was one of the first European apples to be brought to America. Calville Blanc d’Hiver and Lady apples appear to be the subjects of Claude Monet’s oil painting, “Still Life with Apples and Grapes” from 1880. First cited in 1776, it is one of several varieties with “reinette” in its name, a French term for russeting. 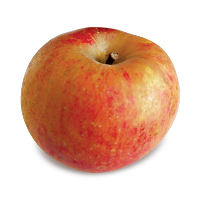 Most reinette apples are very old, dating back to at least the 1700s. GERMANY’S CONTRIBUTIONS to New England are similarly old, with one exception: Corail. 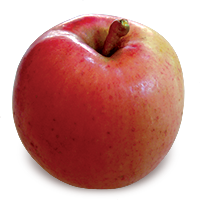 Corail is a late-season apple with a conical shape and streaks of bright red over a yellow-orange skin. Its white flesh is crisp and juicy, and it resists browning when sliced. Corail’s flavor is more tart than sweet, with hints of pineapple or citrus. 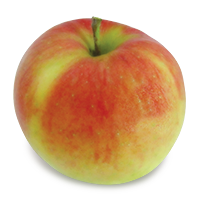 Corail was developed in 2000 from Golden Delicious, Cox’s Orange Pippin, and Duchess of Oldenburg parents. It is now marketed under the trademarked name Piñata, and Stemilt Growers of Wenatchee, Washington, holds exclusive rights to grow, market, and sell it in the United States. 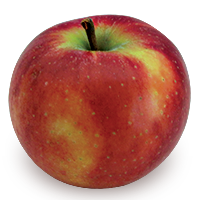 Some New England growers had already purchased Corail, though, and they are allowed to continue to grow and sell the apple using that name. It is also known as Pinova or Sonata. 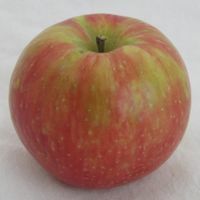 Gravenstein is an early season apple, medium-sized, slightly blunt and conical, with blurry red streaks on a thin green skin. Its cream-colored flesh is crisp and juicy, with flavor that is more tart than sweet. It is especially good in pies, sauce, and cider, and it stores better than most early varieties. Dating back to at least the 1600s, Gravenstein was popular in New England from the late 1800s until the 1930s. It migrated across Europe, probably originating in Germany, although it may have been discovered in Italy. It first appeared in Denmark about 1669 and England in 1819. Gravenstein, German for the southern Denmark town of Gråsten, is strongly identified with Denmark — it was declared Denmark’s national apple in 2005. 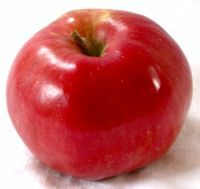 It may be one of several European apples imported to the United States by the Massachusetts Horticultural Society in the 1800s. Red Gravenstein is an early season sport variety (resulting from a mutating branch) of Gravenstein. Medium-sized, slightly blunt and conical, it is redder and sweeter than its parent. Its cream-colored flesh is crisp and juicy, with a nicely balanced, sweet-tart flavor. Red Gravenstein was first cited in 1873. 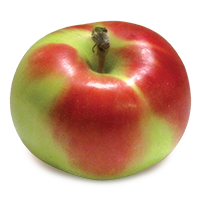 Holstein is a medium, round, mid-season apple, yellow in color with red streaks. Its cream-colored flesh is coarse-textured, moderately crisp, and juicy. Its flavor is balanced between sweet and tart, and it stores well. Holstein was discovered by a teacher named Vahldik in Eutin, Holstein, in 1918. Its parentage includes Cox’s Orange Pippin. 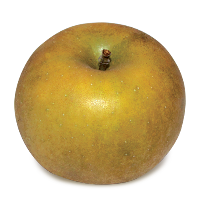 Zabergäu Reinette (źab-ər-gau̇ rĭ-ńĕt) is a medium to large, mid-season apple, with light, copper-colored russeting over yellow skin. Its crisp, cream-colored flesh is moderately juicy, and its spicy, nutty flavor, more sweet than tart, intensifies in storage. It is good for fresh eating and in cooking, and it keeps well. Zabergäu Reinette was first grown in 1885 in Württemberg, on the Zaber River in southwestern Germany, but was not widely distributed until 1926. 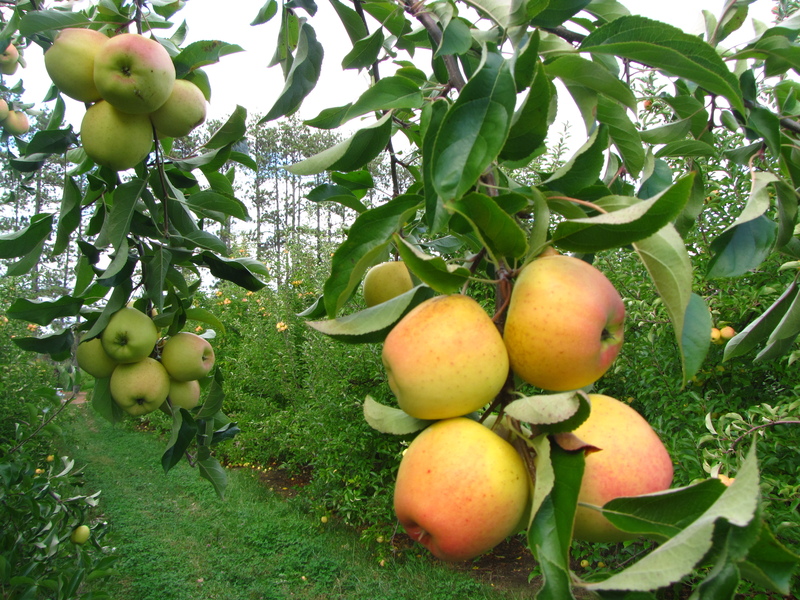 THE NETHERLANDS has produced three apples of note that can be found in New England orchards. 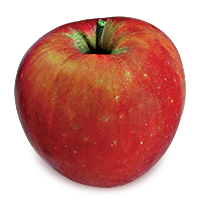 Elstar is a medium to large, late-season apple, yellow with red streaking. 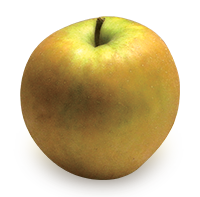 Its cream-colored flesh is crisp, and its flavor, more tart than sweet, has been compared to Jonagold. It is a good fresh eating and cooking apple. Its flavor mellows some in storage. 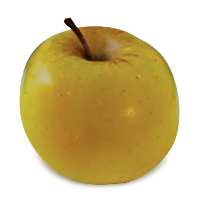 A cross between Golden Delicious and Ingrid Marie, a variety from Denmark dating back to 1910, Elstar was first grown in the Netherlands in the 1950s and released commercially in 1972. While it prefers a cooler climate, it is not yet widely grown in New England. 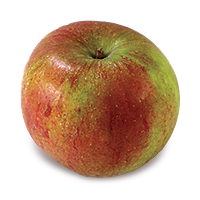 Karmijn de Sonnaville is a medium-sized, mid-season apple with complex coloring, with shades of red, orange, yellow, and green. Its crisp, juicy flesh has a rich, spicy flavor balanced between tart and sweet. It is outstanding for fresh eating and excellent in cider. 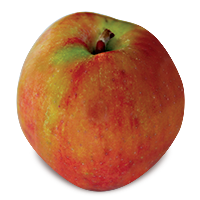 It was raised by Piet de Sonnaville in 1949 on his family orchard in central Netherlands from Cox’s Orange Pippin and Jonathan or Belle de Boskoop parents, and introduced in 1971. Like Jonagold, Karmijn de Sonnaville’s exceptional flavor and beauty have not resulted in commercial success in the United States, as it is challenging to grow and difficult to name. 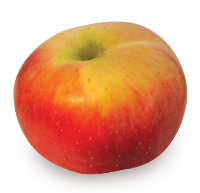 Belle de Boskoop is a medium to large, late-season apple with a round, boxy shape. It has russeting around its stem and in a netting pattern over much of its distinctive orange-red skin. Its crisp, light-green flesh is aromatic, moderately juicy, and more tart than sweet, with hints of lemon. Its flavor becomes sweeter in storage, and it keeps well. Belle de Boskoop was discovered by K. J. W. Ottolander in 1856 in his nursery in Boskoop, near Gouda. It was introduced in North America in Canada around 1880. 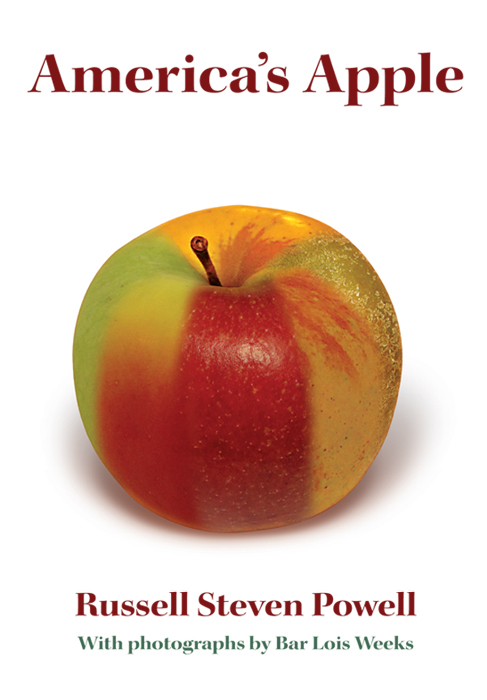 RUSSELL STEVEN POWELL will read from and sign his new book, Apples of New England (Countryman Press) at two central Massachusetts locations this weekend, including the Tower Hill Botanic Garden, which maintains one of the largest preservation orchards in New England, with 119 pre-1900 varieties.